1) It doesn’t have much flavor (and their are cheaper meats that are way more flavorful). 2) I’m becoming more aware ofÂ the way animals are treated on their way toÂ and at the slaughter house – the veal making process is typically not very humane. When I invited a family friend over for dinner I let him choose between 2 main courses I was thinking of preparing, and guess what he chose? 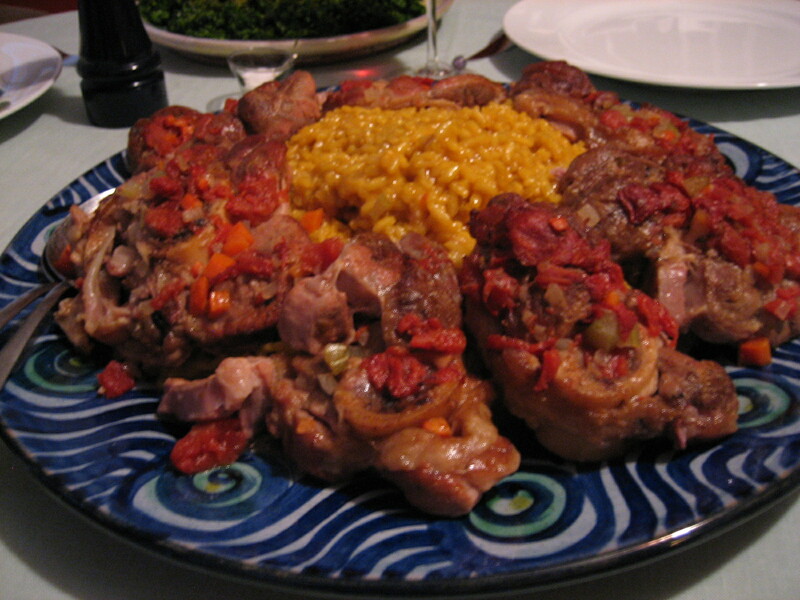 Yes, veal, specifically osso buco. I made saffron risotto for the accompanying starch because it was traditionally what my mom made w/ osso buco.Â ForÂ the veggieÂ I kept it simple and madeÂ broccolini which I served at room temperature w/ lemon and olive oil.Â ForÂ dessert I churned another batch of sweet potato gelato w/ candied pecans (it is quickly becoming one of my favorite flavors!). Â **In a bowl, mix together and set aside until service. 1) Season veal shanks w/ salt and pepper and dredge in the flour, shaking off the excess. 2) In a heavy skillet heat 3 tablespoons each of butter and olive oil over moderately high heat until the foam subsides, then brown the shanks in batches, adding some additional butter and oil as necessary, and transfer them to a platterÂ when browned. 3)Â Add the wine to the skillet,Â bring to a boil and scrape the brown bits from the sides and bottom. Reduce untilÂ only 1/2 cup of wine remains and reserve in a small bowl. 4) In a flameproof casserole just large enough to hold the veal shanks in one layer, cook the onion, carrots, celery and the garlic in the remaining 4 tablespoons of butter over moderately low heat, until the vegetables are softened. 5) Add the shanksÂ to the casseroleÂ w/ any accumulated juices, as well as the reserved wine mixture and enough broth to almost cover the shanks. 6) Spread the tomatoes over the shanks, add the cheesecloth bag, the salt, pepper to taste and bring the liquid to a simmer over moderately high heat. 7) Preheat oven to 325 degrees F,Â cover the casserole and braise Â for 2 hours or until veal is tender. 8) Tranfer shanks to an ovenproof serving dish, carefully remove the strings and keep warm in oven. 10)Â PutÂ pan juices in a gravy boat at service time. 2) In a large, heavy saucepan,Â melt 3/4 of the butter and cook the onion over medium heat until translucent, stirring frequently. 3) Add wine to the onion and continue cooking until wine is nearly evaporated. 4) Add the rice and cook for 2 minutes, stirring to evenly coat the grains. 5) Add 1 cup of the hot broth, season w/ salt and pepper, and stir almost continuously until the liquid evaporates.Â Ladle in more broth, continue stirring, while liquid evaporates. Continue this process until rice is between al dente and tender. 6) A few minutes before rice is done, add the diluted saffron and stir until well incorporated.Â Stir inÂ the remaining butter Â and 1 cup of the parmesan cheese. 7) Serve w/ remaining parmesan cheese. As you can see in the photo, I mounded the risotto on the center of a very large serving dish, then carefully (so they remained intact)Â placed the osso buco around the risotto.Â I didn’t sprinkle them w/ a bit of the gremolata as the recipe indicated because I wasn’t sure if everyone would like itÂ – I let them add the gremolata if desired. 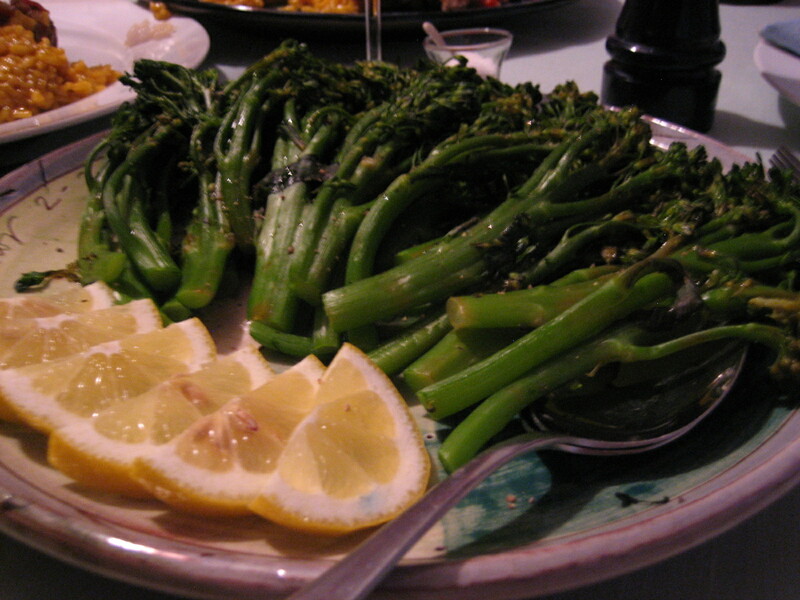 If you have any parsley left, you can use it to garnish the serving dish too. We had a great week flying around the US and sampling the food of the region whenever we had the opportunity! We started our eating tour in Denver, where we had dinner at Las Brisas, a great little Mexican restaurant near our hotel. I don’t have any photos but you can click the link for their menu. Next stop Jackson Hole, where we had lunch at Sweetwater Restaurant. They serve great elk burgers and elk sausage sandwiches! The next evening we found ourselves in Des Moines, Iowa. We had dinner at CentroÂ (sorry, no photos, but check out the link), then strolled around the Des Moines Art Festival which was in progress. As luck had it,Â later in the weekÂ we landed in New York City. We stopped in the Shark Bar at Spring and Mulberry Street for a couple of Belgian beers (Hoegaarden wheat), then headed over 1 block on Spring to Lombardi’s to sample some of their famous coal fired oven pizzas. The ovens heat up to 850 degrees F, creating a beautifully crispy, chewy and blistered crust. I tried to get the dough recipe, but apparently it’s top secret! After the pizza we headed over to Little Italy for dessert at Ferrara Cafe. They serve great gelato and cannoli among other things! Hope you enjoy the photos…. You are currently browsing the brunosdream weblog archives for the month July, 2007.